Wedding is the foremost occasion for every bride to be. So ladies if anyone of you is about to marry then this article might help you in your wedding look. Well you have everything done like your wedding dress, the flower arrangements and every essential part of your wedding but you have something very important to look after and that is your hairstyle. If you have nice and natural long hair then you have plenty of options that you can choose from and glam your wedding look. There are lot of long wedding hairstyles like updos, half up and half down, waterfall braids, low bun, high bun, side swept or you can add an accessories to your long hair. Numerous hairstyles to choose from, Don’t worry we are here to help you to get perfect wedding hairstyles for long hair on your big day. Here showing that your long hair is made in the most romantic way, this style is the perfect and provide you the best choice to decorate with a hairpiece. This long wedding hairstyle will surely enhance your beauty. 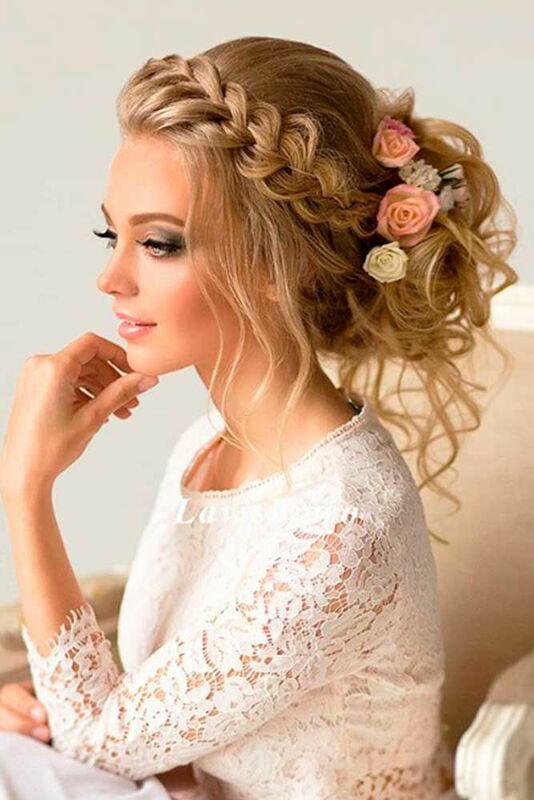 If you are going to be bride and having a beautiful long hair then this wedding updo is the perfect option for your long locks. If you want to try something new and different then this Greek long hairstyle for wedding is the best option for any bride to be. We have showing you the gorgeous and elegant Greek wedding hairstyles for you. Wedding is an important event for every bride. The bride must have to look best from the rest. She should be perfect in all aspects for wedding. Here you can see we are talking about wedding hairstyle and this half up curly side hairstyle for long hair is the perfect for any bride. Half up half down hairstyles look very nostalgic and beautiful, whatever type of it you choose. It will make your hair look super chic. Make it little loose and relaxed. A normal half up hairstyle for long hairs is somewhat classy and romantic, such a cute hairstyle will truly suits almost every wedding bride, especially you want to make it vintage or glam. As above said that half up half down hairstyles look very romantic and beautiful. You can add some accessories like headband or you can wear crown on it for totally glam look. Memorize the crowd with these stunning black wedding hairstyles for long hair! If you are blessed with naturally long hair then try this ultimate hairstyle and be the show stopper. Long wedding hairstyle is a traditional look for any bride in her wedding. You can look beautiful and elegant just add some accessories or you can wear this lovely floral band to enhance you gorgeous look. We swear to adore bridal hairstyles for long hair from now and then! Headband is something that you can wear as an extra accessories. People will surely notice your headband look if you put it in right manner. This is one of the example of long wedding hairstyle. You can call it half up half down too. Half up half down hairstyles is the one style that are suitable for most of the bride. You can make lot of variation to have this look. Ladies you deserve the best look for your hair on your big day. Just go for a totally nostalgic look with loose curls that will look undoubtedly cool with headband. Having the best wedding hairstyle can be a task with lot of options for any bride. If you are having the best long hair then don’t worry this long wavy hairstyle is the perfect option for you to wear on your huge day. Long hair is somewhat simple to work with, and that allows lot of wedding hairstyle options.If you add an accessories to your long locks then it will definitely look elegant and different. Long hair allows you to experiment and by that you can try many options for your wedding hair. This is one of the example of updo hairstyle for wedding. When it comes to updos, messy twisted is the one that you have to try it on your big day. If you are having curly hair then nothing to worry. Just do this amazing side curly long hairstyle for your wedding. This hairstyle will surely make you look new and fresh. Loose braid with very soft waves and fresh floral pin. Try it to believe it. You will surely gonna be the apple of everyone’s eye. If you are going to be bride we believe it’s the most special day of your life. You have to look best on this day. Here we are talking about choosing the right hairstyle and we also believe it can be tough task. If you are having long hair then updos are the best options for you. Waterfall Braid is a gorgeous way to style your hair for your wedding. It will look very creative and elegant as well. Try this different hairstyle for your long hair on your big day. Well we have provide you enough information about half up half down hairstyle. This is one more example about this lovely hairstyle. Long hair is an asset to any bride. You have lot of option to explore if you are blessed with long hair. In this long wedding hairstyle you can add curls and enhance your look. Try this beautiful updos, side braids, and half-up-half-down styles. We bet nobody will look prettier than you on your wedding day!